Chicago, IL. Good teams find ways to win. In what was probably the worst weather conditions ever for a home game, with high winds, damp raw temperatures, and at times heavy rainfall, both teams slipped, slided, and fumbled their way through four quarters. The Force defense stepped up after a shaky performance the week before and held a scrappy West Michigan Mayhem (2-2) team to two early field goals enroute to a 15 -6 victory to keep their record perfect at 5-0 with three regular season games to play. The Force defense set the tone with a four and out on the opening kickoff, stuffing the Mayhem for short yardage gains led by Amanda Malsch, Amber Burns, Darcy Leslie, Angie Bandstra, and game day MVP Melissa Whyms, who seemed to be in on every tackle. A good punt started the Force first offensive possession on their 16 yard line. A couple of tough runs by QB Sami Grisafe and RB Brandy Hatcher, who carried most of the work load due to the absence of Jessica Springer were negated by two mishandled snaps due to a wet ball and resulting in 12 yards lost, keeping the Force pinned at their own 18 yard line. Grisafe shanked the punt off the side of her foot for a net 4 yard kick to the 22. Mayhem QB Nicole Beier was cautious with a slippery ball making deliberate handoffs to Catherine Converse and Heather Anderson, to set up a successful 34 field goal by Mary Beth McMillan at the 8: 18 mark of quarter one. The Force fumble woes continued. On third down and four at their own 26, a high snap to Grisafe was lost and recovered by Sarah Claxton at the Force 18. Four plays later McMillan converted another field goal, this one from 36 yards at 5:50 and a 6-0 lead. Three incomplete passes by the Force gave the ball back to the Mayhem with good field position at the Force 37. The Mayhem were driving again but were thwarted right at the end of the quarter by an interception by Whyms who ran the ball back to the Michigan 13. Another Force fumble spotted the ball at the Michigan 2. Mayhem RB Jennifer Plummer had no chance after a Beier handoff at the goal line, as Bandstra got the Force on the scoreboard with a smothering tackle for a 2 point safety at 14:44. The Force took the lead for good, taking advantage of the free kick from the safety. On the first play from scrimmage rookie RB Leslie Johnson took a Grisafe handoff, and scampered 59 yards showing breakaway speed down the right sidelines for the score. The 2 point conversion try was no good. Grisafe padded the lead for the Force with just one minute to play until halftime. Rolling out right she threw a pretty pass to Ashley Berggren on a post pattern, good for a 23 yard touchdown. Carolyn Lee kicked the extra point for a 15-6 Force advantage at the half. The second half was fought in the trenches. The halftime score would also be the final score. Big stops by Kina Brown and the rest of the defense won the game for Chicago. But it was Tricia Charbonneau's leg that saved it. Grisafe had struggled all game as the punter, with 3 shanks. Charbonneau came in and pinned the Mayhem deep in their territory with punts of 44 and 42 yards. 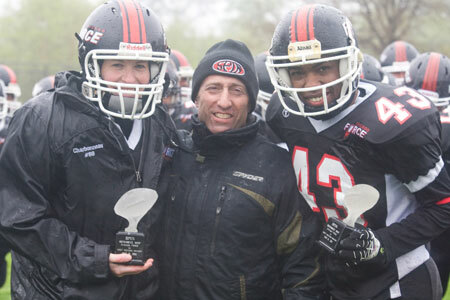 Charbonneau was awarded Offensive MVP and Melissa Whyms was named Defensive MVP. The Force defense controlled the game with 16 tackles for loss, 2 sacks and an interception.